China’s non-financial corporate debt stock has now outstripped that of the United States. According to Standard and Poor’s, China’s corporations owed $14.2 trillion at the end of 2013 versus $13.1 trillion owed by U.S. corporations. Under liberal estimates, up to thirty percent of China’s corporate debt is owed to the shadow banking sector – trust companies, other company lenders such as state-owned enterprises, and other non-bank financial entities. The rest is owed to banks. China’s corporate debt structure is therefore quite different from that in the United States, where most debt is owed in the form of corporate bonds and bank loans. The difference between the debt structure of corporations in China and the U.S. is crucial. In terms of non-bank borrowing: while Chinese borrowings from the shadow banking sector are neither guaranteed by the state nor by deposit insurance, and generally meet lower standards of risk with low to no transparency, U.S. borrowings from the corporate bond sector are traded on the open market, and have clear risk ratings and high levels of transparency. China’s debt structure is therefore riskier than the U.S. equivalent, and worrisome due to its sheer size. As China’s economy declines over the short run, which corporates are at risk of loan default? Access to bank, trust and entrusted loans has increased China’s level of corporate debt and leverage ratios, with corporate bond issuance remaining at a minimal level. While bank loans in China have tended to be extended to large and midsize firms, and particularly to state-owned firms, trust and entrusted loans have been extended to firms of more varied size and ownership structures. Some of these latter entities have riskier business models and fundamentals. They often lack a well-established credit history of sufficient collateral, and sometimes even lack a strong underlying business model. Across both the banking and shadow banking sectors, industries with the highest leverage ratios include the real estate, metal and mining/steel, infrastructure, and construction industries. Private firms are most at risk in the face of potential loan deterioration, particularly within industries with high leverage ratios. In the face of underdeveloped bankruptcy resolution, Chinese firms are encouraged to work out their debts as best they can. State-owned firms have a clear advantage – firms backed by the state may receive capital injections in the form of new bank loans, while bank loans that have turned nonperforming can be pulled of the books of the largest state-owned banks and purchased by asset management companies. By contrast, private firms do not have such a luxury. 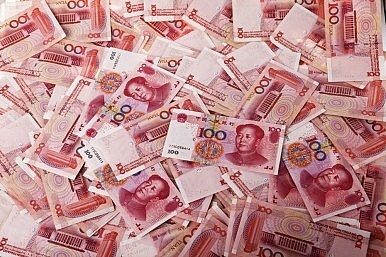 Firms that have faced default in recent months have mainly been private firms; examples are Zhejiang Xingrun Properties, which defaulted in March on RMB3.5 billion ($562 million) in bank and other debt, and Shanghai Chaori Solar Energy Science and Technology Co, which defaulted in March on an RMB4 million bond coupon payment. Not all state-owned companies with sagging debts have been kept afloat, nor have all private firms been forced to default. Changjiang National Shipping Group, a state-owned tanker company that withheld information about its debt for several years, was delisted from the Shanghai Stock Exchange on June 4. China Rongsheng Heavy Industries Group Holdings Ltd., China’s largest private manufacturer of ships and marine engines, was bailed out by the government in July 2013. Some trust loans to private companies have also been bailed out by local governments, despite no guarantee that this would occur. These cases are exceptions, however, rather than the rule. In the majority of recent cases, firms visibly facing financial distress have mainly been privately owned. The debt undertaken by these firms has been a direct consequence of the environment of excess fixed asset investment tacitly promoted following the global financial crisis of 2008, and of the growth of the shadow banking sector, which allowed riskier entities to obtain financing. While not all loans to private firms are at risk, those situated in slumping industries may face an increase in potential default. Although over time, reform of state-owned enterprises may change the way deteriorating debt is dealt with, it appears that in the short run, state-owned enterprises within the same sectors may face troubles that will be whisked off the books via additional bank funding. In terms of the shadow banking debt that is most at risk, from what we have seen, trends in trust loans and entrusted loans currently provide mixed evidence for a potential debt crisis. While many trust products, some of the riskiest shadow banking instruments, came due for payments in May, there were no defaults, and potential trust defaults as a percentage of total trust products have so far been relatively low. At the same time, entrusted loans have experienced a string of defaults and analysts are increasingly watchful of these less regulated debt products. In sum, although state-owned corporates may face debt difficulties, they are, as has been historically shown, more likely to be bailed out than private firms. Private firms most at risk are those in industries experiencing negative returns and high leverage ratios. The lending channels considered to be least safe for these firms are within the shadow banking industry, and how the deleveraging process unfolds will be closely tied to the increased regulation or winding down of shadow banking subsectors. The IMF offers contrasting recommendations for Asia’s two largest economies. What Does ‘L-Shaped’ Growth Imply for China?China’s Draft BudgetChina’s Battle to Regain Economic ControlSlouching Tiger, Roaring Dragon: How China Still Outpaces IndiaMultinationals: Enduring China’s Slowdown?